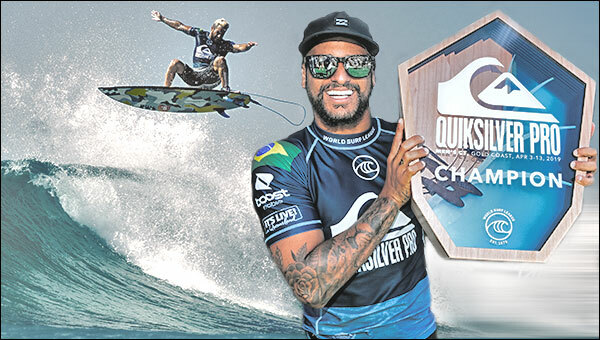 Coolangatta, Queensland/AUS (Monday, April 8, 2019) – Italo Ferreira (BRA) and Caroline Marks (USA) won the Quiksilver Pro and Boost Mobile Pro Gold Coast, the opening stop on the World Surf League (WSL) Championship Tour (CT). The Final Series took place at Duranbah Beach, the event’s backup site, in two-to-four foot (0.6 – 1.2 metre) waves to determine the first winners of the season. 2019 WSL Championship Tour will now head to Stop No. 2, the Rip Curl Pro Bells Beach. The event window will open on April 17 and run through April 27, 2019.